JEWS HAVE TAKEN OVER the “local newspaper” in America. One might think that because of the large number of local newspapers across America a safeguard against Jewish control would be in place. 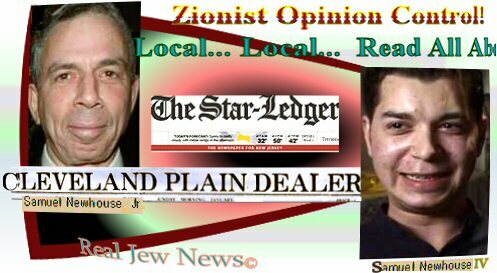 However most “local newspapers” are owned by companies controlled by Jews whose offices are hundreds of miles away. The Newhouse Empire of the Jewish brothers Samuel, Donald, & Theodore Neuhaus (surname changed to Newhouse) illustrates the insatiable appetite that Zionists have for opinion control. Today the Newhouse Empire, under the parent corporation of Advance Publications, (owned by descendents of Samuel & Donald Newhouse), owns 40 “local newspapers” across the USA. These include the Newark Star Ledger, the Cleveland Plain Dealer, & the Portland Oregonian. 1895: Solomon Neuhaus born in New York City. 1922: Newhouse buys the Staten Island Advance Newspaper. 1939: Newhouse buys the Newark Star-Ledger. 1950: Newhouse buys The Oregonian Newspaper. 1955: Newhouse buys the St. Louis Globe-Democrat Newspaper. 1959: Newhouse buys Conde Nast Magazines. (New Yorker, Vogue, Golf Digest, Glamour, Gentlemen’s Quarterly, Parade). 1967: Newhouse buys the Cleveland Plain-Dealer Newspaper. 1980: Newhouse family buys Random House Book Publishers. 1981: Newhouse family buys multiple cable television systems with over 500,000 cable subscribers. 1982: Newhouse family buys Fawcett Books. 1986: Newhouse family buys Fodor’s Travel Guides. 1995: Newhouse family and Time Warner Cable combine cable systems to create large clusters. 1999: Newhouse family buys Women’s Wear Daily. 2003: Forbes magazine estimates the worth of the Newhouse family at $15 billion. Stop Controlling Our Opinions Through The Media! And That Christian Publishers Take The Helm Once Again! I often debate in the religion forums of these Newhouse Brothers’ online newspapers, and they like to ban my posting ID/Handle on a frequent basis. Sometimes because I know as much as they do about computer technology given I have 20 plus years of high level computer experience, they totally have to shut their forums down for a few days in order to stop me from posting. What I get on a regular basis is they ban all postings which look down upon secular Jews, while they leave postings which accuse and blame Christians for the problems of the world. But I have warned these folks that it will take my death in order to get me to quit posting to these forums, either that or they will have to take the forums down entirely off all of their newspapers. I post in 5 of their online newspaper forums on a daily basis. Thanks for this article exposing who they are and the extent of their control over the large city newspapers. When Lucifer rebelled against the Godhead, and fell from the grace and presence of the Almighty, his name was changed to “Satan”. In rebelling against the Godhead, he ran counter to the very nature and “core” of his being created by the Godhead, to become someone and something that the Godhead never meant to be, nor even imagined within the unlimited imagination of the Godhead, thereby becoming the original Dr. Jekyll / Mr. Hyde, the original “split personality”, the original “altered state of consciousness”. This former “angel of light” was not just any angel of all that had been created by the Godhead, but the TOP created being of all that had been created within Creation. Not content with such an exalted position and near-unlimited power, status, and influence, he not only desired to be more “like God”, but to BE “God” over ALL that the Godhead had created - including over the Godhead themselves! But there can be only ONE TRUE GOD! So Lucifer, in being the “nexus” between the Godhead and Creation, utilized his unique position, power, status, and influence to begin a “smear campaign” against the Godhead and a “public relations defense” in support of himself - “situational ethics and morality” was thereby born, in direct yet sublime opposition to the Laws of God. Lucifer put forth the best arguments and “spin” that he could conjure forth - all covered over by just the correct amount of the “Light of God” still within himself to make his “media blitz” convincing - all masking the ever-expanding black hole of darkness consuming his very soul. There is a darkness so dark, so as to appear as light. Via his tightly-controlled mixture of facts and truth with wrongful conclusions, Lucifer convinced and/or coerced one-third of the existing angels/life-forms to follow in his rebellion against the Godhead. “And there was war in heaven”. For Lucifer/Satan and his followers, the “Truth of God” was sacrificed/murdered in favor of the “lies of self” in their ambitious unified-field-theory of unholy wanton war to create their own “self created reality” of an “altered-state universe” unto their own “self interest realizations”. Truth is the first casualty of war … and of “self” outside and apart from God. The quote above is just one verse out of a whole heated dialogue between Jesus and certain “Jews” who believed themselves righteous because they were Abraham’s physical children/descendants. But Jesus rightfully fired back that they not only failed to do the deeds of God, as per the Torah, but also failed to do even the “deeds of Abraham”. Consequently, there was only one “father” left that they could be lineaged to - their father … “the devil”. Harsh, harsh, harsh was Jesus’ retort to these certain “Jews” - but so RIGHTFUL and TRUE as to cut to the bone of their issues and arguments, leaving them with no wiggle-room, no defense, no “self” justification. And so would He be today against certain “Jews” (and non-Jews) who have betrayed their fellow Jews (and non-Jews), and Humanity at large, for the sake of “self” and exchanging the Truth of God for the lies of Satan. Satan, the “prince of darkness”, desires Mankind to believe in him as “Lucifer”, the “Angel of Light” - as he once was when under the Godhead. He wants Mankind to believe that he is the benefactor unto Mankind - and that God is the denigrader of Mankind. He wants Mankind to believe that he is “God”, and that “God” is satan. And he wants Mankind to continue to believe in his lie that “surely you will not die”, as he delivers his promise unto Mankind via the unlocking of DNA manipulation unto life-extension and eventual immortality via the Tree of Knowledge of Good and Evil. 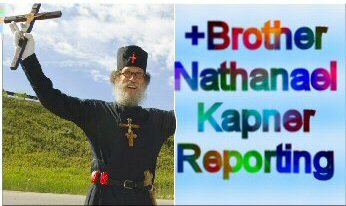 For those within the “media”, or any other profession or occupation, who use a mixture of facts and truth with wrongful conclusions, you are of your father the devil and will suffer the same fate as he, unless you repent of your lies and sins, and turn unto Jesus Christ for your deliverance and salvation. As Jesus declared unto the “Jews” who were arguing with Him in the quoted verse above, “for unless you believe that I am He, you will die in your sins” - John 8:24. Not even being of Abraham’s physical “seed” could save them. Not even being as the “rich young ruler”, who followed all the Laws of God under the Torah Covenant from his youth onward, could save them. Only “for unless you believe that I am He” could save them … as well as all Mankind since, who have exchanged the Tree of Life for the Tree of Knowledge of Good and Evil, the truth for a lie. Your message is of monumental importance, if what you say is true, which I am very inclined to believe, at this point. In fact I think it takes a lot of courage and you are obviously a man of purpose. Can you tell me the purpose of dancing in the streets ( I saw a video of you dancing at a park), or are you just having fun? When I started street evangelism I was reaching out to teenagers and thought dancing might be a way to connect with them. I am going to trace my family tree just to make sure I’m not related to these guys. You are a man of purpose, am happy to see someone that can expose the evil machinations of the Zionist. You are truly a great man. It takes a man of courage to confront and expose the awesome materialistic power of the Zionist. The big and mighty tremble before them, but you are special and they are terrified by just a click to your website.